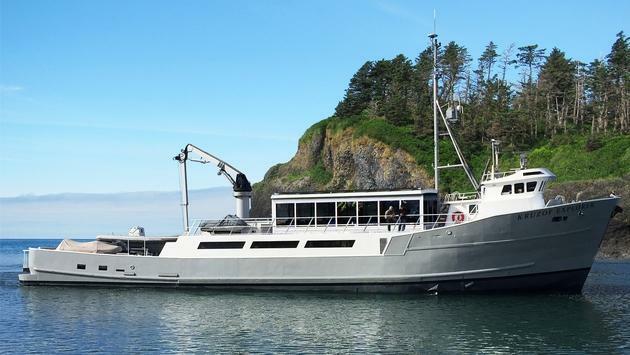 The Kruzof Explorer, the newest addition to Alaskan Dream Cruises’ fleet, will return to Alaska waters under the small-ship cruise line’s ownership. A Bering Sea crab fishing boat in its first life, the vessel underwent major renovations to transform it into an elegant and modern passenger boat, most recently running charter expeditions in California. Now a converted, 128-foot, 12-guest expedition vessel with a large outer deck for wildlife viewing, the Kruzof Explorer adds an upscale option to the Alaskan Dream Cruises’ fleet. It offers spacious staterooms with ensuite bathrooms and large, landscape windows, as well as an expansive dining room, bar and lounge area with panoramic views. The space that previously served as the crab hold, once containing all of the king crab caught during fishing runs, is now a theater room, where films and presentations can be shared with guests. The Kruzof Explorer will be outfitted with a high-speed Zodiac, kayaks and paddleboards for guests to use on daily adventures. The vessel’s five-ton crane, which once hauled crab pots, will load and unload the expedition craft, giving guests a glimpse into its working past. The Kruzof Explorer will sail some of the most remote areas of the Inside Passage. Its 2019 “Alaska’s Remote Wilderness Expedition” itineraries will explore the length of Southeast Alaska from Glacier Bay National Park and Preserve to the Alaska Native village of Metlakatla in 10 days, either starting or ending in Alaskan Dream Cruise’s hometown of Sitka. Guests will cruise in waters around the West Chichagof-Yakobi Wilderness, a remote stretch of Southeast Alaska that few travelers have the opportunity to experience. Time will also be spent in the tiny fishing village of Pelican, walking the boardwalk “roads.” A full day will be allotted to exploring and kayaking off Admiralty Island, also known as “Fortress of the Bear.” And another day will be spent in Glacier Bay National Park and Preserve, watching wildlife and calving glaciers and learning about the ancestral home of the Huna Tlingit. Guests will explore the small communities of Metlakatla, where they visit a Tsimshian longhouse and meet Native artists; Kasaan, where they can hike to the only remaining traditional Haida longhouse in the United States; and Wrangell, known for its Petroglyph Beach. Other highlights include tidewater glacier viewing in the Tracy Arm-Fords Terror Wilderness, a “wild, unfinished Yosemite” according to John Muir; whale watching and wildlife viewing; and remote rainforest hikes. The “Alaska’s Remote Wilderness Expedition” will be offered on eight departure dates from July to Sept. Rates are set at $12,495 per person, but an inaugural season discount of 20 percent brings the fare to $9,895, including accommodations on the ship, all meals and beverages (non-alcoholic and alcoholic) during the sailing, scheduled shore excursions, airport transfers, use of recreational equipment and exceptional onboard services. Itinerary details can be found online. Alaskan Dream Cruises’ six-ship fleet also includes the Alaskan Dream, Admiralty Dream, Baranof Dream, Chichagof Dream and Misty Fjord. 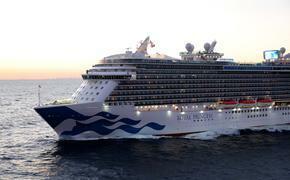 These ships hold between 10 and 76 passengers.